We believe that the more you know, the better our doctors can help you! While our office does not require a referral, your insurance company may. Medicare (Red, White & Blue Card) and PPO's never do. However, HMO plans almost always do. Spreading of the infection to other areas. It depends. You typically do not need a referral to see a Podiatrist. Medicare and PPO type plans never require a referral. However, HMO type plans almost always require a referral. Podiatrists are regarded as specialists, so if your insurance company requires a referral to see a specialist, then you will need to get a referral from your primary care doctor. Just let them know you have a foot and ankle problem, and that you want to see a podiatrist. We are on most insurance plans, however if you are not sure, please call the office and we will verify what your insurance requires. If you have any concerns about your feet and/or ankles or you're just after some advice, call our office today. With four podiatrists and four locations, we can typically offer appointments within 24 hours and we offer immediate care for medical emergencies. Does Thomas Podiatry And Associates Take My Insurance? We accept all insurances, including Medicare. How Often Should I Change My Orthotics ? Should I See A Podiatric Surgeon vs Orthopedic Surgeon For My Foot Problem? An easy home treatment and a great way to remember this treatment is "RICE". ( I )ce: For a 20-minute cycle apply a towel- wrapped ice pack to the sprain (this is a cycle of 20 minute on and 20 minutes off). This cycle is used to reduce the swelling. ( C )ompression: To help restrict the swelling wrap an elastic bandage tightly around the injury. This should be re-wrapped every 3-4 hours to make sure compression is firm. ( E )levation: Elevate the foot and ankle to be even with your heart. Elevate the foot or ankle with a pillow. This aids fluid away from the injury. 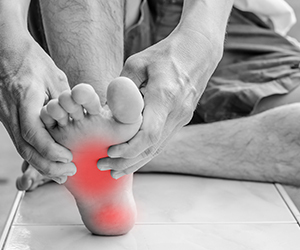 Make sure to see a podiatrist as soon as possible after the injury to make sure the sprain isn't more severe! Use and ice pack to reduce swelling, inflammation, and pain. Exercise your feet. Some good foot flexing and stretches can help stretch out the plantar fascia, and make it feel better. You can get more information about stretching online from the American Academy of Orthopaedic Surgeons. What Is The Treatment Course For PRP and Topaz Plantar Fasciotomy For Heel Pain Or Achilles Tendon Pain? This is a noninvasive treatment and can eliminate heel pain in as few as 6 treatments. Treatment sessions are only 7 minutes in duration. We schedule your first 3 treatments for 3 consecutive weeks, then we take an ultrasound to see the progress. Many patients get pain relief in as little as 8-10 days after the first treatment. Our insurance verification specialist will check to see if your insurance covers this procedure. This recovery varies depending on a few factors. These factors are the procedure chosen to correct the bunion, the patient's age, and medical status. The procedure is out-patient and patients are advised to rest and elevate their foot for the first few weeks following surgery. Patients will have to wear a surgical boot and then transition to a gym shoe once sufficient healing has occurred. The problem of dry cracked heels is caused mainly from heredity. Heredity is something we can't change, however your doctor can help control and treat the problem. If your heel is cracked and bleeding, it is vital to see a podiatrist because any open wound can become infected. If you are only dealing with dryness and cracking, applying a good moisturizing cream at least twice a day can help. Try sleeping with socks on at night after your apply cream to your feet; this will help soften your skin. We have an over the counter product, Kerasal, that is great for dry, cracked feet! After the dry skin is softened, use a pumice stone to remove the exfoliated skin. If you are finding that these solutions are not working, your podiatrist will have several prescription cream options. Warts are caused by a viral infection. They are contagious if direct contact is made with them. The viruses that cause warts live in warm, moist environments and may be transferrable on moist towels, at spas, pools, locker rooms, etc. A helpful way to avoid contracting wards on your feet is to wear footwear in these environments. There are many people that have flat feet and never face any problems with their feet. If there is a family history of flat feet with family members needing surgery or having bunions, hammertoes, or other foot conditions, then YES, your child should be treated. This does NOT necessarily mean surgery. Your child might need something as minimal as a good insert recommended by their podiatrist. The BEST thing to do is to have your child's foot examined, then you will be able to go from there to find the best treatment option. To learn more about Podiatric Services, please contact us at 410-749-0121410-749-0121 today or click here to schedule an appointment.